Postoperative synovectomy or arthroplasty (short base). Pull the pattern over the thumb all the way down, bring the edges together and stick them temporarily. Place the splint pattern on the dorsal aspect of the hand to fit precisely over the MCP joints. Mould the palmar portion proximal to the transverse skin crease. Close with a hook and look tape. 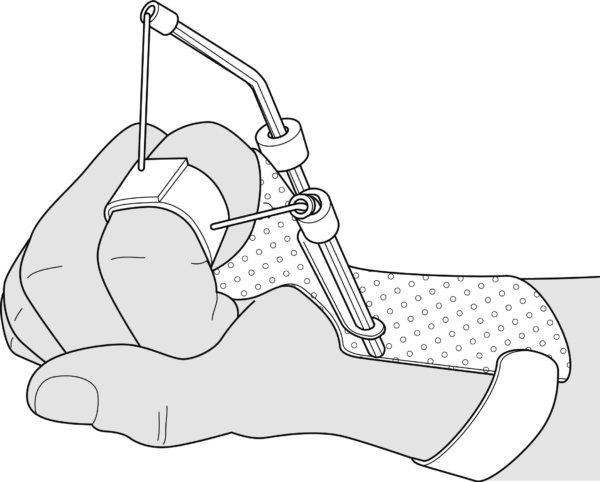 Mould an Orfitube as shown in the drawing, and stick a Single Orfitube Adjuster to the splint base with an Orfitube in line with the index finger. Make a finger loop with Orfilight, stick an elastic to it and thread through the tube. Provide an adjustable sliding knot. Mould a second Orfitube to be placed laterally along the index finger with the tip of the tube perpendicularly to the proximal phalanx when in full flexion. Attach a non-elastic cord laterally on the finger ring and tighten only when the index finger is in full extension. Pay attention to the pressure on the ulnar styloid process. Apply a broad velcro strap proximally under the forearm.